In 1867, Amos Mendenhall of Cerro Gordo, Indiana, patented a practical calculator (US patent 67786). The patent model of the device (up to 1880, the US Patent Office required inventors to submit a model with their patent application) is still preserved in the National Museum of American History, Washington, D.C. (see the image below). The practical calculator of Amos Mendenhall is a square metal box with overall measurements: 5.4 cm x 13 cm x 13.8 cm. The box has a boss in the centre inside, in which the shaft of a cylinder is to turn. 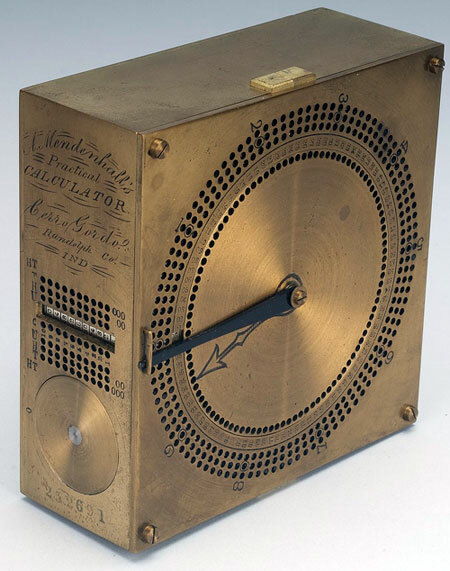 The practical calculator of Amos Mendenhall is an adder with a brass box which has a rotating disc inset in the top. There are 100 small holes around the rim of the disc. Outside the disc, on the top of the box, is a circular ring numbered from 01 to 99, with a gap at 00. Outside of this are three rings of holes, with 100 holes in each ring. These holes are to be used to hold markers indicating digits carried when the disc makes full rotations. On the side of the box is a rotating multiplication table. Amos Mendenhall proposed two methods for recording numbers over 99. The first was a set of 9 holes around the edge of the fixed disc, into which the operator could place a pin. Whenever the rotating disc moved a full turn, the operator moved the pin up to the next hundreds digit. Mendenhall suggested a mechanism which would count the number of times the upper plate rotated, and hence give the hundreds place. If the operator rotated especially energetically, and arrived at higher numbers, he suggested a system of pins to be used to represent thousands and higher places. Mendenhall family were descendants of the early settler John Mendenhall (b. 1658, in England), who came to America and settled in Chester Co., Pennsylvania, in the early 1680s. 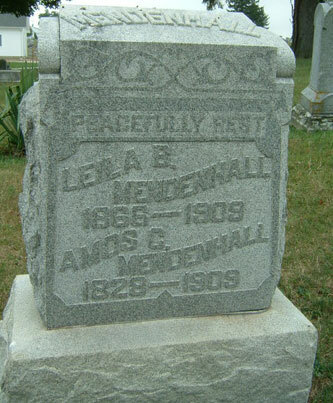 Amos Cowgill Mendenhall was born on 16 November, 1828, in Clinton County, Ohio, to Hiram Mendenhall (20 Feb. 1801-30 Jun. 1852) and Martha Ann Hale (23 Jun. 1801-5 Aug. 1880). Amos had 2 sisters (Rowena, (1822-1887) and Martha, (b. 1826), and 7 brothers (Joseph Hale (1824-1908); Nathan, (b. 1830); Jacob Hale (1833-1885); John and William, twins, (born and died in 1835); Samuel H. (1836-1923); James Hiram (1839-1909). Hiram L. Mendenhall was a minister, miller and farmer by trade and a Quaker and abolitionist in belief, one of the most outstanding figures to be found in the list of Quaker pioneers. In 1836 Mendenhall clan (Hiram together with his father Nathan and several of his brothers and their families) moved from Clinton County, Ohio, to Randolph County, Indiana, where he entered 400 acres of land (a wild forest), and opened a fine farm. 3 years later he erected a saw mill, then 2 grist mills, and later on a woolen factory. In 1837 Hiram Mendenhall laid out the town of Unionport, and in 1845 went on to pool his property with others to form the Unionport commune of the Society for Universal Inquiry and Reform. This effort soon collapsed (only 1 year later), leaving the Mendenhall's financial situation hopeless. In 1850 during the California Gold Rush Hiram and Amos went to California to recoup the family fortunes in the gold fields. They didn't find gold, but eventually erected a saw mill on the Sacramento river, and sold it for a goodly sum of money. In 1852 they embarked for home upon a steamer by way of Havana, Cuba, but Hiram died of cholera on 30 June on shipboard in the Gulf of Mexico. Amos, his mother, and his siblings continued to live in the vicinity of Unionport, where Amos managed a farm, general store, manufactured goods, etc. He obviously was an imaginative man and very good mechanic, because besides the above-mentioned patent for the calculator, he is the holder of 4 more patents for: gold mining devices (US360713 and US540997); tricycle (US453151); bicycle (US740156). Amos Cowgill Mendenhall never married. He died on 10 April, 1909, in Unionport.